Not just another day at the office ... or is it? These are "moments that cannot be ignored"-events, actions, comments that stop people in their tracks and, in one fell swoop, make it blindingly clear that an organization is stuck and unable to move forward. And they have become regular occurrences in today's corporations, non-profits, and educational institutions as new forms of work, communication, and technology expose the ways in which an organization's culture-or "the way we do things around here"-conflicts with new competitive demands. The result: telling incidents-all too visible elephants in the room-that reveal underlying conflicts as well as hidden assets. 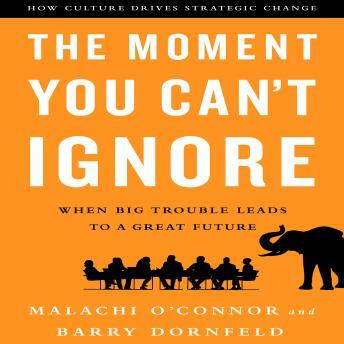 In The Moment You Can't Ignore, Malachi O'Connor and Barry Dornfeld tell fascinating "you are there" stories of people and organizations as they encounter and then navigate through and beyond these un-ignorable moments, and show what we can learn from them. They outline the big questions organizations need to ask themselves about identity, leadership, and the capacity to innovate that an understanding of culture can help answer, and deliver powerful insights into recognizing and harnessing hidden assets that point in the direction of a new future. In our age of porous organizations and constant change, The Moment You Can't Ignore demonstrates that the adage, "culture eats strategy for lunch," is more relevant now than ever.